an FAQ published by the Centers for Medicare and Medicaid Services (CMS) Centers clarifying the circumstances under which COBRA qualified beneficiaries may switch to exchange coverage. Each development is discussed in turn, below. On May 2, 2014, the Department of Labor, the agency responsible for COBRA notice and disclosure duties, published online updated versions of both the “general” notice (given upon initial plan eligibility), and the “election” notice (triggered by a qualifying event). The notices now expressly identify the availability of exchange coverage, including access to premium tax credits for those eligible, as an alternative to COBRA coverage. The model notices currently are posted online at the DOL website in English, and Spanish language versions will soon follow. Also on May 2, 2014, the Department of Labor issued an advance copy of proposed regulations (technically, a “Notice of Proposed Rulemaking”) pursuant to which future model COBRA notices may appear in written agency guidance, including through online posting, rather than as “appendices” to proposed and final regulations published in the Federal Register. One of the stated reasons for this approach is to “eliminate confusion that may result from multiple versions of the model notices being available at different locations.” And in fact, if view the online version of DOL Technical Release 2013-02, which in May of last year announced earlier exchange-related revisions to the model COBRA election notice, the link to the model notice link now clicks through to the most recent update posted last week, rather than to the version that originally was issued with the Technical Release. May 2, 2014 also saw publication online of Affordable Care Act FAQs Part XIX, of which Q&A 1 summarizes the above developments and directs readers to the new model COBRA notices and the proposed regulation. FAQ Part XIX contains additional guidance on a number of ACA issues including cost-sharing limitations, coverage of preventive services, and Summaries of Benefits and Coverage. I will cover this new guidance soon in a separate post. Generally, an individual may enroll him or herself in exchange coverage upon first becoming eligible for COBRA, during an exchange open enrollment period, or upon exhausting COBRA coverage. However, persons currently enrolled in COBRA may have elected to do on the basis of COBRA notices that did not identify exchange coverage as a COBRA alternative in these situations. Accordingly, on May 2, 2014 the Department of Health and Human Services issued a bulletin announcing a limited special enrollment period, lasting until July 1, 2014, during which COBRA qualified beneficiaries in states that use the Federally Facilitated Exchange or Marketplace may drop COBRA coverage and enroll on the FFE. The guidance does not mandate that state-run exchanges extend the same special enrollment period. Against that background, some speculation as to COBRA’s future is warranted. COBRA continuation coverage, enacted in 1985, was in essence a legislative response to pricing and underwriting barriers to individual coverage that the Affordable Care Act has either eliminated (for instance, by banning pre-existing condition exclusions) or made less burdensome (for instance, through access to premium tax credits and cost sharing on the exchanges). Without question, the health exchanges are a “disruptive technology” to the COBRA model, but COBRA continuation coverage likely will remain in some demand until such time as individual exchange coverage is comparable, in terms of provider networks and in other respects, to current group coverage. That tipping point may not occur for some years, or even at all. What is likely in the short term is that COBRA’s already steep adverse selection rate will continue to climb, as continuation of group coverage becomes more and more about retaining access to a broad network of healthcare providers. 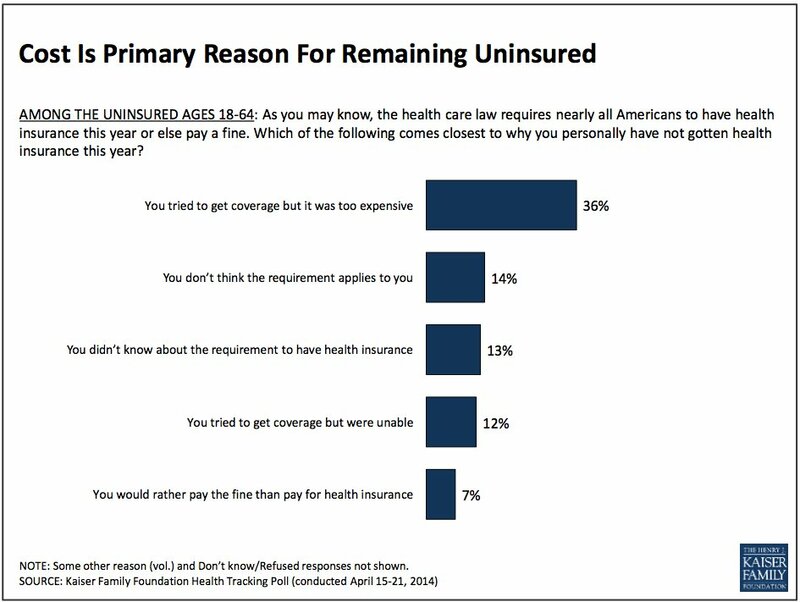 The top reason uninsured people didn’t enroll in coverage under Obamacare this year is they still don’t feel like they can afford health insurance, according to a new survey. The findings in a report published by the Henry J. Kaiser Family Foundation Tuesday highlight the affordability gap facing some U.S. households, especially those with incomes near or above the income cutoff for tax credits that reduce premiums, or those who simply don’t believe health insurance is a good value. Thirty-six percent of people without health coverage reported they looked for health insurance during the enrollment period that nominally ended March 31, but found the available plans too expensive, according to the Kaiser Family Foundation survey. Just 7 percent said they preferred to pay a tax penalty under the law’s individual mandate, rather than purchase an insurance policy. Others said they believed the mandate doesn’t apply to them, didn’t know about the mandate, or tried and failed to enroll. Health insurance remains a costly product and the Affordable Care Act targets its financial assistance to low-income families. Tax credits to defray the cost of coveragearen’t available to households that earn more than 400 percent of the federal poverty level, which is $45,960 for a single person. The law also provides subsidies to reduce out-of-pocket costs for those who earn up to 250 percent of poverty, or $28,725 for an individual. The tax credits provided under the Affordable Care Act are pegged to the price of the second-cheapest “silver” level plan in a person’s geographical area, and to household income. The subsidy gets smaller as income increases, so people who earn near 400 percent of poverty receive relatively little help paying for their coverage, and those who make just a little more pay full price. The average national price for one of these benchmark silver plans is $808 a month for a household of two 40-year-olds with two minor children that earns over 400 percent of poverty, which is $94,200 for a family of four, according to a calculator on the Kaiser Family Foundation website. The same family making exactly 400 percent of poverty would be eligible for a tax credit worth $63 a month. The vast majority of those enrolling in private insurance under Obamacare are getting help paying for their coverage. As of March 1, 83 percent of enrollees received tax credits for premiums, according to the Department of Health and Human Services. The Kaiser Family Foundation report includes quotations from some of those surveyed that illustrate the point of view that health insurance is too costly. “What’s out there now is just unaffordable,” one respondent said. “Because I think food on the table is more important,” wrote another. Coloring those views may be a general lack of awareness about the availability of the tax credits, previous surveys have shown. Although not addressed in the Kaiser Family Foundation poll, the largest affordability gap in health coverage is found in 24 states that didn’t adopt the Affordable Care Act’s expansion of Medicaid to more poor people after the Supreme Court made it optional for states. Those earning up to 133 percent of poverty, or $15,282 for a single person, were supposed to have access to Medicaid, while tax credits are reserved for those who earn at least poverty wages, which amounts to $11,490 for an individual. That meansthe poorest residents of those 24 states aren’t eligible for any help, so millions are expected to remain uninsured. 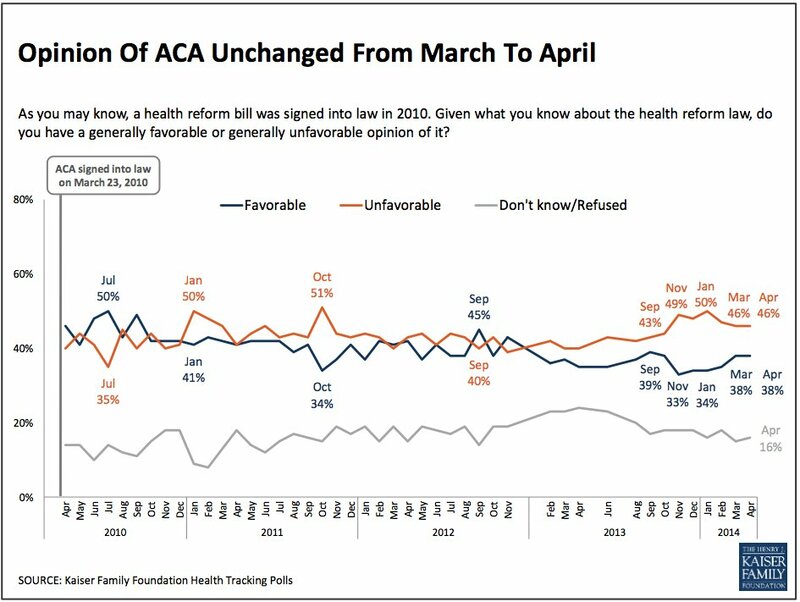 The Kaiser Foundation Family poll also shows a majority of Americans continue to disapprove of the Affordable Care Act, with 46 percent having an unfavorable view, compared with 38 percent holding a favorable opinion. These attitudes are closely tied to partisan affiliation, with Republicans being much more likely to disapprove and Democrats more likely to approve. A majority, however, wants Congress to improve the law, compared with more than one-third who would prefer it to be repealed and replaced with an alternative. Despite President Barack Obama trumpeting the news this month that private insurance enrollments via the Obamacare exchanges have exceeded 8 million — or 1 million more than the highest projection from the Congressional Budget Office — the public doesn’t see it that way. 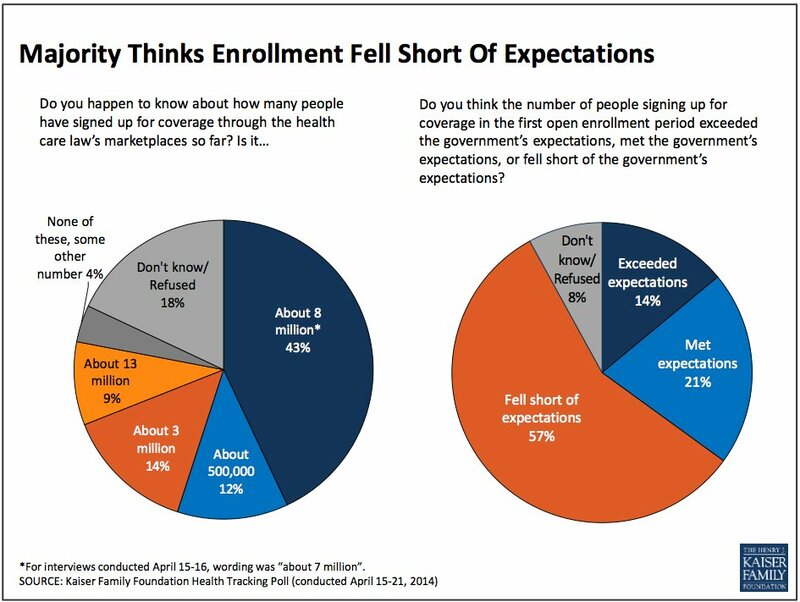 Even though more than 40 percent were aware that signups had topped 8 million, nearly six out of 10 said enrollment came in below the federal government’s expectation.